Flying at Light Speed Is Pretty Much Impossible—Unless You’re Han Solo #SciFiSunday « Adafruit Industries – Makers, hackers, artists, designers and engineers! WIRED gets real about Hans Solo’s light speed piloting skills. SPOILER ALERT. I’M going to talk about Star Wars: The Force Awakens. If you haven’t seen it by now, I have a feeling that you either don’t really care about the movie or you don’t care about spoilers. But don’t worry, I’m not going to give away anything major. Still—you have been warned. In one scene in the movie, Han Solo and Finn (oh, and Chewbacca too) are trying to get on the surface of the Star Killer to disable the shields. Here is the important dialogue as they approach the planet. Finn: How are we getting in? Han: Their shields have a fractional refresh rate. It keeps anything traveling slower than light speed from getting through. Finn: We are making our landing approach at light speed? Shortly after, Han says “OK Chewie, get ready…and now!” Then Han pulls a lever (mostly likely to come out of light speed) and I’m not sure what Chewie does. 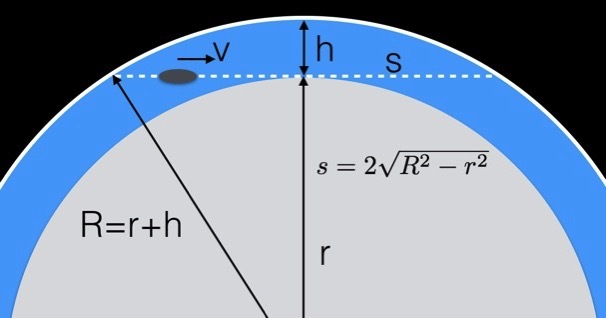 Now, if Han Solo is flying the Millennium Falcon at light speed, and he wants to stop the starship inside the shield (but not inside the planet), how large of a time window would he have to react? Of course I am going to start with a picture. This is the Starkiller Base and the shield (not drawn to scale).